Most motorcyclists start in Chicago, IL, some come in at various join up points, to ride Route 66 - the Mother Road of the United States and one of the most famous highways in the world. The Mother Road Rallysm spans the first route to link the Midwest with Southern California. It is an 'All Brands Invited Event'. This is a "closed event." All bikes must be properly registered to ride in the Rally. A Route 66 Motorcycle Tours. Kirk Woodward organized the event in 1995. He Called It "THE MOTHER ROAD RIDE RALLY". He wanted participants to get a first hand look at real Americana during the Ride. Before Route 66 was opened, the Midwest and the West Coast were practically different countries. After Route 66 was stitched together, economic as well as social barriers fell. The first surge was the poor displaced by the Dust Bowl years. John Steinbeck's book The Grapes of Wrath, documented their travels and troubles. The second surge was during and immediately after World War II. 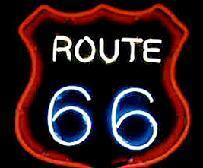 Bobby Troup's song, Get Your Kicks on Route 66, was written when Troup traveled to California in 1946. Participants in the Rally will be able to ride segments of the Route 66 that were used by millions of people as they motored west. They will even be able to ride the eight foot wide segments that were 'state of the art' in the 1920's but barely wide enough for a single car now. The television series, Route 66 that ran for five years in the 1960's and starred Martin Milner and George Maharis introduced Route 66 to a new generation of fans. While it is true that the Interstate Highway system replaced much of Route 66, there are hundreds of miles of the original Route still waiting for people to discover while riding this Route 66 Motorcycle Tours. Happily it is not necessary for people to ride the entire 2,448 miles of the road to enjoy what Route 66 has to offer. There are join up points all along the route, so a person can ride as much or as little as they have time for. Many people take part over several years - traveling the Route in segments rather than all at once. Early registration is advised, As motel rooms fill up quickly.